“How could I possibly be expected to handle school on a day like this?” asks hooky master Ferris as cameras cut to sunny clear skies. “This is my ninth sick day this semester. It’s getting pretty tough coming up with new illnesses. If I’m going to go for ten I’m probably gonna hafta barf up a lung. So I better make this one count,” Bueller continues. And boy, does he make it count. Stuck in the daily grind of making ends meet, many of us have probably envied Ferris his legendary day off. Maybe you’ve even indulged in a sick day when your symptoms amounted to little more than mild headache. There’s just not enough hours in the day and you figured you may as well cash in on one of your sick days to get on top of your housework and renew your passport during the government offices’ incomprehensibly inconvenient opening hours. But, for nearly half of Ontario’s workforce, taking a sick day to rest and recuperate from a virus, let alone catch up on life administration, is out of the question. Studies estimate that about three million Ontario workers have no paid sick days. Worse still, it is estimated that over a million of these workers don’t have job protection for taking even a single, unpaid sick day off from work. The cruel irony is that the lower a worker’s wages, the less likely they are to have paid sick leave entitlements. Even if they are entitled to take unpaid sick days, many low-wage earning workers simply cannot afford to take any unpaid time off work, even if they are ill. This means that many minimum wage workers in food services, for example, must continue to work when they are sick just to make ends meet. The thought of a cook with a runny nose and a bad cough is concerning, but with minimum wage still stuck below $12/hour, the lost wages of a day off to recover mean that going to work sick is sometimes the only option. 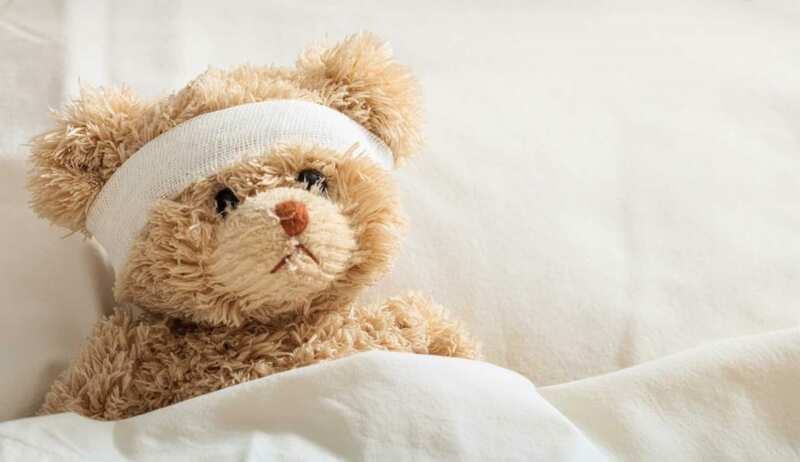 Nevertheless, research suggests that providing paid sick leave can hasten recover and reduce overall health care costs. Back in 2015, Minister of Labour Kevin Flynn initiated the Changing Workplaces Review to assess Ontario’s labour laws and propose changes to suit the needs of the modern economy. 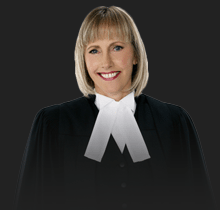 The review brought up many issues from minimum wage to leaves of absence. In June, the Ministry of Labour introduced the Fair Workplaces, Better Jobs Act. 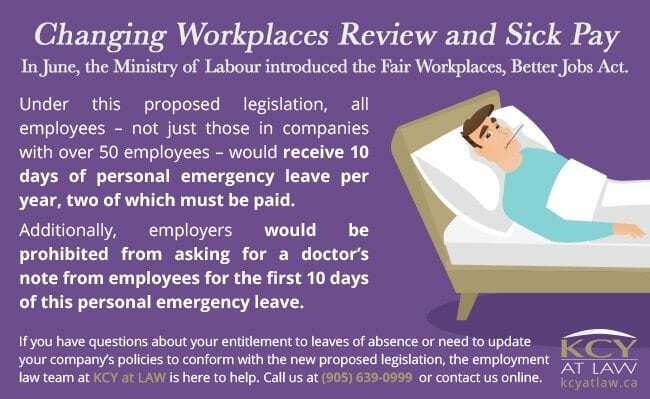 Under this proposed legislation, all employees – not just those in companies with over 50 employees – would receive 10 days of personal emergency leave per year, two of which must be paid. Additionally, employers would be prohibited from asking for a doctor’s note from employees for the first 10 days of this personal emergency leave. Far from an invitation to pull a Ferris, this new legislation would give Ontario workers the chance to take the time they need to recover when they are sick and be more productive workers when they are on the job. If you have questions about your entitlement to leaves of absence or need to update your company’s policies to conform with the new proposed legislation, the employment law team at KCY at LAW is here to help. Call us at (905) 639-0999 or contact us online for more information.